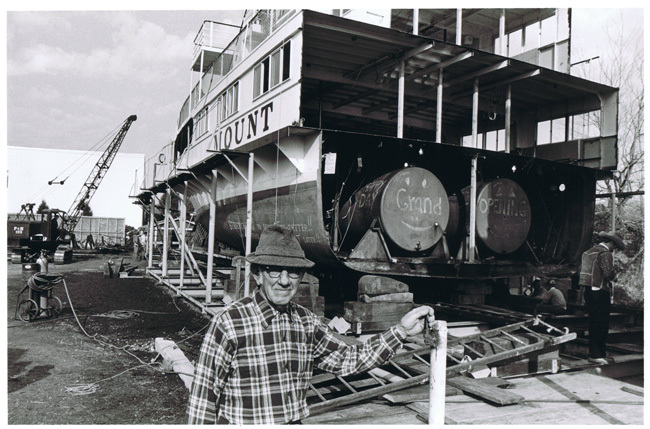 In 1982, Byron Hedblom returned to New Hamshire from retirement in Arizona to oversee a project to extend the length of the Mount Washington by cutting the ship down the middle and inserting an extension. "a blast from the Mt. Washington's whistle, the two halves of the boat's 205-foot hull were separated with clockwork precision." The separation, "completed while the boat is in a railway dry dock" here, "is was part of a winter-long project to add a 100-ton, 24-foot section to the middle of the famous excursion boat and increase interior seating capacity by 100." Keeping a watchful eye on the entire operation was veteran shipbuilder Byron Hedblom, a former owner. A crane was scheduled to lift the new 24-foot prefabricated hull section into place, Nov. 3. "In days ahead, remaining pieces of the new section — all of which have been pre-built in the shipyard here — will be lifted into place and 'tack welded.' Once the entire section has been inspected, the permanent bonding weld will be made." Byron Hedblom with One Half of The Mount!